June already, and the winter solstice will be upon us soon, but this year’s warm, dry autumn lulled us into a false sense of summer in the garden for so long! Finally there’s been enough rain to refill the tanks, but this winter looks like continuing the trend of being warmer and drier than average. It is so easy to forget to water potplants when the mornings are chilly, but a few days of neglect is all it takes for them to droop. Out with the watering can and thank goodness for the rain in the tanks. Over the last month we’ve spent a bit of time looking at our soil, getting some expert testing and analysis from market gardener and community soil analyst Nat Wiseman*, and replenishing the goodness in our raised vegetable beds – aiming to more effectively overcome the water repellence that sometimes develops over summer in the sandy loam, and to supply more of the main nutrients (nitrogen, phosphorus and potassium) needed for strong vegetable growth. We worked bentonite clay and sheep manure into the raised bed soil along with blood and bone, and used an organic-based wetting agent and plenty of water, digging it all through until the soil started holding the moisture properly again. We’ve since planted out our first winter veg, and when spring comes we’ll be increasing our irrigation (more dripper lines, closer spacing and pulse watering) to achieve a more effective distribution of the number one fertiliser – water! Our main winter task is now to work on the soil around our fruit trees – to add the right soil amendments, in the right sequence, to achieve an optimal mineral balance as well as maintaining the existing high level of organic matter. Nat’s analysis has been invaluable here, as it pays to have a baseline measure before investing in a lot of inputs to the soil. He’s also been able to advise us on how best to incorporate the resources we produce here over the longer term, to reduce reliance on imported materials and ultimately eliminate waste on site. One of the most useful home-produced inputs to our garden is compost made from our chook manure, food scraps, garden clippings and recycled paper and cardboard. Each week the contents of the chicken coop are scooped out into a tub to go to the compost. The poop hatch is frankly my favourite feature of the whole chook palace. While the old manure and bedding are mixed into the compost bin and start to break down, fresh newspaper, dry leaves and herbs are spread in the chook coop for clean bedding, keeping the coop smelling sweet and providing a healthy environment for the chooks. The finished compost is the main source of organic matter to our fruit trees, and provides a buffer for any added fertilisers. With good rain has come lush new green growth on road verges and paths – grass seeds have germinated and edible weeds have sprung up. While a few of these are great in a salad (e.g. young wild lettuce, sow thistle and dandelion leaves), they really come into their own as fresh green feed for chooks who can readily convert them to protein in the form of eggs for us. Fresh greens contribute to really deep golden yolks. Our girls are contained to their yard (for the safety of our vegetables) so we have to bring the greens to them. We’ve found that our chooks can snack much more easily on their greens if we stand them tightly packed in a bucket with some water to stay fresh for a couple of days. 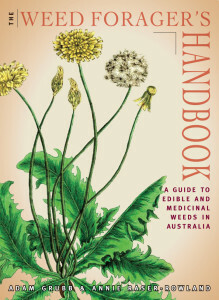 The Weed Forager’s Handbook by Adam Grubb and Annie Raser-Rowland is a very engaging, portable and well researched guide for weed foraging expeditions. Soil has cooled down considerably in the last month or so. It’s now too cold for planting citrus and subtropical fruits. For planting bare-rooted deciduous fruit trees, prepare the hole wider than it is deep, loosen the soil below, and do a drainage test – especially if you’re on clay soil, and even more so if you’re planting trees that are sensitive to wet feet – add gypsum if poor drainage is a problem. Add good compost – but particularly to the backfill soil and around and beyond the drip-line of the tree, where most of the feeder roots will grow. Give deciduous fruit trees a formative pruning to start establishing their framework as soon as they are planted. If you need to transplant deciduous trees while they are dormant, use a sharp spade to cut around the rootball (keeping in mind how big a rootball you will be able to lift safely), prune the top to keep the tree in balance, and feed with seaweed extract to stimulate new root growth, then transplant it in 6-8 weeks so that it will have its new feeder roots ready to grow in the new position. Veg to plant this month include artichoke suckers, asparagus crowns, broad beans, carrot seeds, broccoli, cabbage, cauliflower, celeriac, celery, kale, leeks, lettuce, peas, radish, rocket, silverbeet, spinach, swede, turnip and watercress, seed potatoes, garlic cloves and strawberry runners. Plant propagation drop-in session – FREE at Park Holme Library, Saturday June 23, 10am-2pm. Organic Corner Store market – Nadja’s Garden stall dates: Thursdays 9-1, June 7 & 21. The stall will be taking a break over July but we can still be contacted for garden consultations & design, fruit trees, plants & seeds. Join Organic Corner Store Group on facebook for news from other stallholders. For a consultation with Nat Wiseman, community soil analyst, email natwiseman11@gmail.com or phone 0401636752. Nat also grows fantastic seasonal vegetables at Village Greens of Willunga Creek. This entry was posted in dirty fun, permaculture design, planting, soil, vegetables, weeds, winter. Bookmark the permalink.